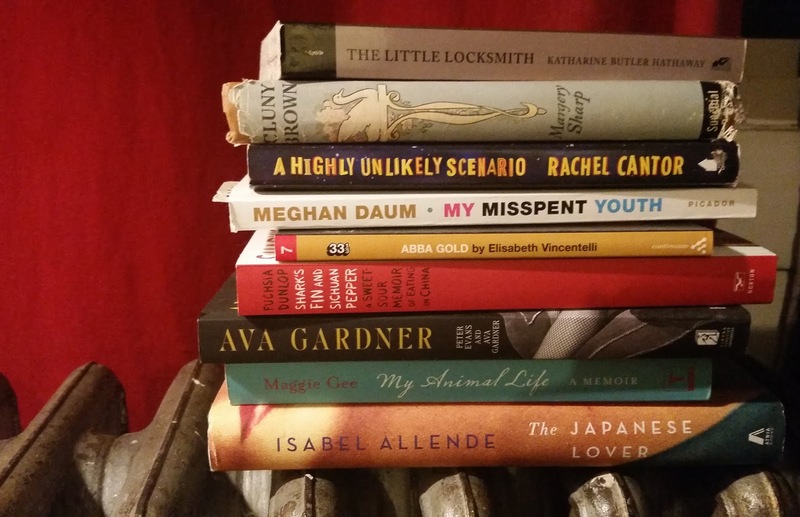 So I did something wild recently: I took a vacation and did nothing but read. I didn’t leave my house, except for some groceries and to donate a bag of clothes to Goodwill. I didn’t plan to go anywhere with my time off except to the library (twice). I dedicated more than one paid day off work to do little more than make a dent into my to-be-read list. This wasn’t a reader’s retreat — though that dream will happen in the future — but rather, it was a staycation with books. A readcation. My readcation was one of the best decisions I’ve made, and I highly suggest scheduling one for yourself as soon as possible. ~Kelly Jensen, "How To Take a Readcation"
I have been thinking of taking some time off in the fall, but am not able to travel. A staycation is doable - there are plenty of local spots I haven't seen. But then I was reading the Book Riot article about taking a readcation, and I thought - that it's it! That's the one for me. I have been amassing an impressive TBR pile, and a lovely October day seems like a great time to curl up with a good book. And tea. And cats. After all, October just feels literary, ever since I read Anne of Green Gables and Anne said "I’m so glad I live in a world where there are Octobers." Pick a time that works for you, stock the pantry, hit the library, unplug, get comfy, host a reading party - those are Book Riot's recommendations. (Somebody else suggested trying to plan a book club readcation, if you like the party idea.) There seem to be a lot of book bloggers talking about taking a readcation after the Book Riot post - and certainly lots of hashtag action on Instagram and Twitter - and someone even posited the question If you could go anywhere in the world, where would you go for a ‘readcation’? I can't imagine leaving my house, since that's where the books, food, and pajamas are, but maybe you'd like to read on the beach. Or by the Seine. Or in a cabin in the woods. It might actually be easier to unplug in a cabin in the woods, now that I think about it, but I'll stay home for the moment. There’s something about reading that makes you feel more conscious. ...after a few hours of reading every day I feel like the world is drawn in darker outlines and richer colors. It’s definitely the opposite feeling I get from a Netflix marathon. Nothing against Netflix but I can understand what Frank Lloyd Wright meant when he referred to television as chewing gum for the eyes. 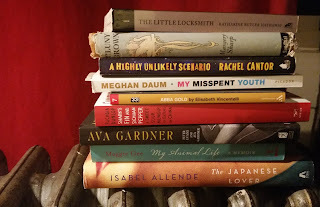 Being able to write about my reading adventure here on the blog is definitely a gift, akin to Eleanor Catton's grant to give writers time to read and then write a non-fiction piece about their reading. Shall we begin? The library catalog only features one title from the fascinating 33 1/3 series, Fear of Music by Jonathan Lethem. Consider checking it out if you are a music geek - each book is focused on one album, with some of the books being fictional, some non-fiction, explorations of the music. I got Abba Gold for Christmas a few years ago and it did not let me down - I love Abba, and after each chapter I had to go to YouTube and watch the videos. Did you know early Abba videos were directed by Lasse Hallström, who later directed The Cider House Rules and Chocolat? Another great entry in this series! These graphic novels are at the edge of my comfort zone, and don't read them while you're eating, but they are fast-paced and imaginative. This is the book that kickstarted Daum's career back in the 2001, only recently back in print. I particularly enjoyed the piece "Music Is My Bag" and the one about flight attendants, "Inside the Tube." She is also the author of The Unspeakable And Other Subjects of Discussion. You can also see some of her more recent pieces on her website. This one has a good buzz, positive reviews, and a decent-sized hold list, but somehow I couldn't engage with the action. I am a huge fan of the Vera Stanhope mysteries, though I know many prefer Cleeves' Shetland series. This one was a solid mystery, with just a few too many mentions of Vera's unprepossessing physical appearance. Have you watched the Vera series on DVD? That came out first in the U.S., and the books have trickled into publication following the show's success. I found this a little lurid for my taste, though I am a huge Ava Gardner fan - I even went to her museum in North Carolina! This makes an interesting companion to the ultimately more satisfying Ava Gardner: "Love Is Nothing." This charming book does for parlourmaids what Mary Poppins does for nannies - both are outsize characters, though Cluny is more whimsical than magical. Margery Sharp is also the author of the Miss Bianca children's book series, which inspired the Disney film The Rescuers. Another whimsical character, this one modern-day, living in Oregon, and working at a library! This is a slim novel, a fast read, but so very rewarding. Very lyrically written, not a word out of place - it might be my favorite of my readcation books. Not my favorite by Allende, and in fact it took me a while to get into it, but in the end I found it enormously affecting. Did you catch her A Word With Writers event at the KiMo last November? Ultimately, my readcation experience was a lot of fun! I curled up on my couch with my cats and took naps around reading. Because I had the whole week, I did get a little restless and ended up doing some other things that took me out of the house - and at one point got caught out by a friend with no physical book on hand! (I did have a library book on the Kindle app on my phone, though.) If you have a few days off owed to you, or a long weekend coming up, I highly recommended a therapeutic readcation. It does a mind good!